Over 40% of food in the US is wasted. We think this is unacceptable. Through our ugly produce and leftover donation programs, we save hundreds of pounds of food weekly and support our local non-profit partners by fueling the community. 1 in every 5 fruits and vegetables don't meet cosmetic standards which usually causes them to go to waste. Sifted rescues crooked cucumbers, twisted zucchini, and oddly shaped apples and turns them into fresh salads and pickled garnishes. This produce is fresh from the farm and just as nutrient dense. Sometimes really good leftovers happen. That’s why we offer our Sifted leftover donation program. 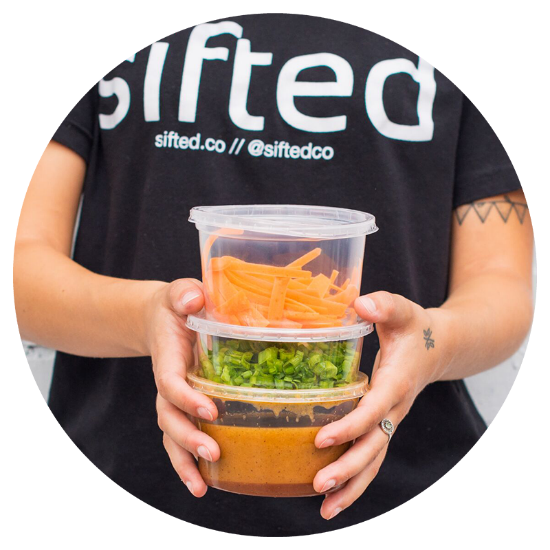 Your Sifted host will either package leftovers and stock your fridge, or you can choose to donate leftovers to our local non-profit partner.